Little by little, the sounds of laughter grow louder and shouting echoes through the dusty hills – the Bushmen have heard our van and are announcing our arrival. 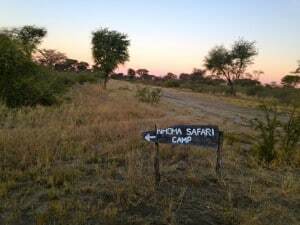 This part of Namibia is not where tourists go to see wildlife. They come here for one reason: To meet and interact with a group of people whose culture is thousands of years old. Some visitors are surprised by what they find. Here at the Destination Stewardship Center we speak quite a bit on the concept of “preservation,” whether for charming villages or pristine environments. But what happens when the main attraction is a living culture? 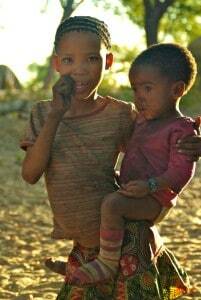 The people colloquially known as Bushmen have resided in parts of southern Africa for several millennia. Famous both for their languages, spoken with clicking sounds, and for a way of life that retains customs and traditions from thousands of years ago, these tribes attract many visitors eager to encounter authentic Bushmen culture. The drive northwest of Windhoek for several hours has taken us tourists through small villages spread farther and farther apart, and for several more hours down a long dusty road off the main tar highway, through desert landscapes interspersed with cattle farms. At the end of an easy-to-miss two-track road, extending up a hill into seemingly nothing, we reach the Bushman village. The entrance to our destination. The specific tribe we are visiting calls themselves the Ju/’hoansi, but our guide assured us that the term “Bushmen” is fine. While there is some debate about whether referring to these groups as Bushmen or, sometimes more commonly, the San, is offensive, this particular group prefer the term Bushmen. At first glance it may seem that Bushman culture has indeed been preserved. The men within these villages still hunt with poisoned arrows and set traps in the sand for smaller birds and animals. Women still collect water and prepare the food. Their languages are unlike anything heard anywhere else. Ceremonies are still conducted around large fires, participants dancing and chanting late into the evening. 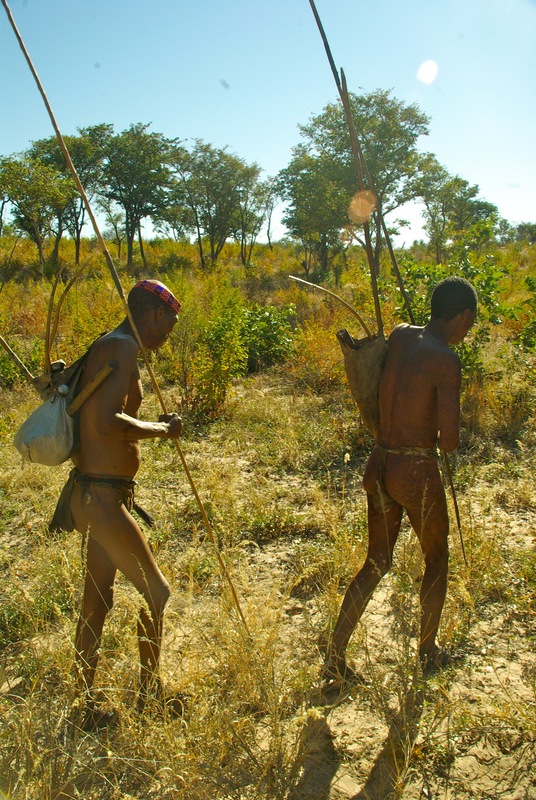 Bushmen hunters in traditional garb during the heat of the day. Observe long enough, however, and you will see the subtle ways in which their culture has evolved. Men and women both don modern clothing on chilly mornings and evenings; often, this clothing includes T-shirts with western sayings and brands. Afrikaans can be heard alongside native languages. Every once in a while, a cell phone may make an appearance. 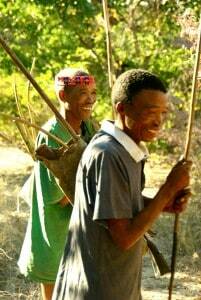 In the morning the Bushmen invite us to join a bush walk, following two hunters on their journey and chores. The men speak Afrikaans to our guide, who translates into English for us. Two barefoot men lead our group, holding long sticks for locating porcupines, bow and arrows slung on their backs. Only one detail detracts from what might be a scene from thousands of years ago: American-style T-shirts. Bushmen hunters in their warmer morning clothing. It is winter in Namibia, and temperatures can dip down to freezing at night. The Bushmen, our guide informs us, are happy to utilize such clothing to protect themselves from the cold. Later, in the village, we meet children wearing traditional leather clothing below and small sweatshirts on top. The women of the village wear long skirts made with fabrics from discarded articles of clothing left by tourists. To some tourists, this modernization may, at best, come as a surprise; at worst, it angers visitors who were expecting a more “authentic” experience. Their misconception is that a so-called “primitive” culture remains frozen in time. In contrast, our own Western lifestyle and culture is expected to constantly modernize and improve. It’s an absolute given that our future generations will live in a world with different lifestyles and technologies. Why should people like the Bushmen not be allowed the same opportunities? The Bushmen are much more integrated into modern society than might be assumed at first glance. Many of the men have served in the military; most of the children go to public schools. Many of the young adults have at one time left the village to live in places like Windhoek, deciding later to return to their village and live a more traditional life. When they return, though, they bring back with them outside clothing, ideas, and technology and integrate them into their lives here at the village. Sisters wearing a variety of clothing styles. In a way, this adaption of some modern amenities is what allows the Bushmen to keep their culture at all. Traditional life is difficult. The younger generation understands this and yearns for an easier life. Denying them the benefits of modern culture would only influence them to abandon their villages completely to move permanently to larger cities. Adopting certain aspects of modern culture strikes a balance that encourages traditional lifestyles to continue. But still, it seems tourists sometimes prefer to view these cultures through a lens in which time does not tick forward. At what point does the tourist gaze supersede authenticity? In some places the Bushmen live completely modern lives but will be bussed to tourist facilities to put on traditional clothes and perform traditional dances. While the resulting photos may appear more like the images tourists have in mind before arriving, this experience is not necessarily authentic. The Bushmen are putting on a literal performance, showcasing only the oldest, most traditional, and – perhaps for outsiders – the most interesting forms of their culture. While these shows may represent how these people conduct certain ceremonies and dances, there is an expectation that they look and act in a very stereotypical manner. Clothing styles other than traditional garb are not worn, even on the chilliest of evenings. Certain songs and dances are chosen by how interesting and entertaining they may be, not on whether they would be performed if tourists were not watching. These so-called traditional experiences are a representation of parts of the Bushmen culture, but are polished and timed to correspond with tourist needs and wants. I argue it is better to see the Bushmen in their donated Nike-shirts and baseball caps, as this is, even if counterintuitive, an authentic experience. 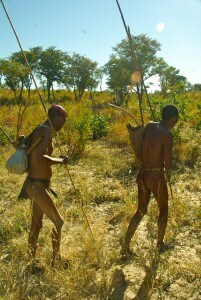 The Bushmen choose to wear this clothing – it is not forced on them. Preservation cannot be the appropriate concept when the subjects are living cultures. Cultures naturally grow and change, and this is a good thing. We need a shift in perspective. Tourists must learn to focus on the authenticity of the culture as it is today, learning how traditions of the past have been incorporated into modern lifestyles. The Bushmen still hunt with methods passed down for thousands of years. If they do so while wearing a branded T-shirt, that should not take away from the experience as a whole. As our camp manager explained while on our bush walk, the purpose of coming to interact with the Bushmen isn’t to see how their ancestors lived thousands of years ago, but to see how they live today. And if that means T-shirts and cell phones, so be it. This entry was posted in Geotourism, Geotravelers, Stewardship and tagged Bushmen, cultural tourism, indigenous tourism, Namibia, San, Tamara Olton by Tamara Olton. Bookmark the permalink.